Internet downtime can be devastating to your business — killing productivity, taking away your ability to generate revenue, and damaging your reputation. 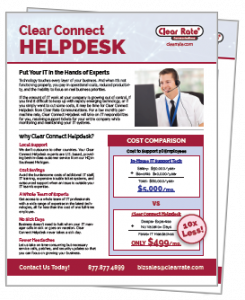 Clear Rate’s Internet Failover solution protects your business against internet downtime with an intelligent system that can detect an ISP disruption and automatically fail your business over to a secondary connection when it does. When your primary network returns, you are automatically and seamlessly routed back. For a low monthly fee, you get completely managed and headache-free protection, and the peace of mind that a network outage won’t paralyze your business. Redundant internet connections are an excellent way to protect your business from internet outages if a single line fails. However, if both redundant connections are delivered via the same means (side-by-side cables in the air or buried underground), your business is still vulnerable to outages caused by physical occurrences such as downed lines or accidental construction dig-ups. With 4G LTE Failover from Clear Rate, your secondary connection is delivered via Verizon’s dependable, unmatched 4G LTE wireless network, ensuring business continuity even in the event of physical disruptions. This is an excerpt from the Failover presentation at the Fall 2017 Clear Rate Client Summit. To see the full presentation, click here. *Higher data allowances available. Speak with a Clear Rate expert for options. Looking for other Failover options? Clear Rate offers many solutions besides 4G LTE, whether we are your primary ISP or you’re simply looking for a secondary ISP. Talk to us today to customize a business continuity solution for you! For maximum reliability, pair the extreme dependability of BroadBeam Enterprise Fiber (proactively monitored by our Network Operations Center and backed by a 99.99% uptime Service Level Agreement) with the proven trustworthiness of 4G LTE Failover. 1 GIG BroadBeam Enterprise Fiber + 4G LTE Failover for only $1,495/mo.